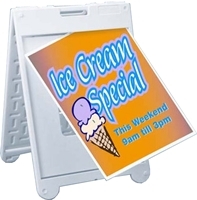 Features 4mm corrugated plastic removable signboard material. All plastic, use indoors and out. 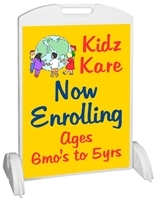 Sign easily attaches using included zip-ties. 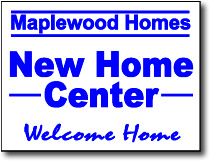 Great for use as Realtor signs! 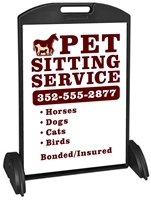 Holds 1 or 2 signs, 24"W x 36"H ea. Choice of black or white stand color. Requires high resolution electronic artwork that is submitted to us ready to print and to scale. If you require additional text or changes then choose the "Custom Artistic Layout" button below. We will design and create a layout for you using your artwork/logo or photo or one of our stock graphics along with the text and options you choose in the steps below. A layout/design proof will be emailed to you for approval. Features unlimited use of colors/graphics, etc. The premier design. We will design and create a layout for you using your artwork/logo or photo or one of our stock graphics along with the text and options you choose in the steps below. A layout/design proof will be emailed to you for approval. Features unlimited use of colors/graphics, etc. The premier design. After your order is completed, we will also email you the high res art files for your order. The spelling and punctuation you enter here will be exactly how we put it on your outdoor sign, so please double check. Thank you. In an effort to give you the most professional design possible, we may alter your suggested layout slightly to better fit the space of the size sign you chose. Use the space below to explain any special layout requests you have -- which line of text you want the largest, smallest, etc. 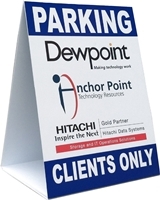 We can also add directional arrows to your sign layout. Oversize shipping surcharge of $26.00 per order applies. 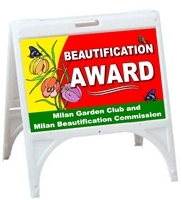 Congratulations, you have finished designing your outdoor sign! 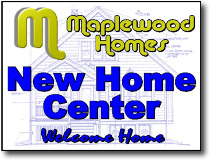 When you click the [Add to cart] button below, your outdoor sign will be added to your shopping cart. Please check your design choices and quantity on this screen before continuing, as you will not be able to make changes within the shopping cart. If you would prefer to speak to a live person at this point. Please call 1-800-640-8180 and we will be happy to assist you.